“So it has happened at last,” said Stitch. They turned to see the frayed old-timer hobble towards them. Stitch had already served under the girl’s mother during her Growing Years. He had a limp, and mismatched button eyes, but the others dearly loved the wise old doll. “What has happened, Mr. Stitch?” asked Theadora. “Crepitus. The Nightmare King. He will send his minions for this sweet child and only we will be able to protect her.” The very thought of it made the old doll puff up his chest in pride. Welcome to this week’s preview for Stuffed Fables! This week we will get to know the worn rag doll named Stitch. 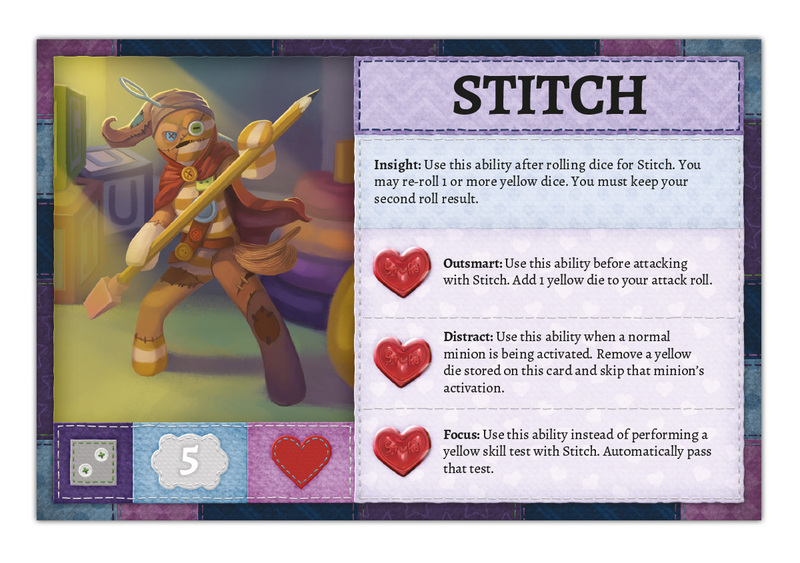 Each stuffy hero in Stuffed Fables represents a unique expression of their little girl’s personality, but Stitch is a little bit different. Stitch is an heirloomer - a special toy that is passed down from generation to generation. Stitch is homemade from old socks and rags, and stitched together long ago by a caring hand. In the little girl’s eyes, Stitch is a lot like her grandpa – kind, wise, and able to grouch while giving you a wink at the same time. Stitch represents the girl’s heritage, and her connection to her extended family. Stitch has been through many adventures and has a surety that comes with experience. He teaches the young stuffies, and impresses upon them the importance of their duty to protect their child’s precious sleep. As players work their way through the story, they too will learn important lore through Stitch’s dialogue. In this way, Stitch’s value is twofold. In Stuffed Fables, different colored dice represent various character attributes, with yellow dice representing perception and communication. Stitch is allowed to re-roll yellow dice. During their adventures, Stitch uses his enhanced perception to help find valuable items or solve puzzles. When talking to strangers, Stitch is the one most likely to get the information needed. Outsmart: No matter what kind of weapon he's using, this ability allows Stitch to use his perception to make an attack far more effective. Distract: With this ability, Stitch uses his intellect to momentarily distract enemies causing them to miss their turn. Focus: Yellow skill tests represent moments where your wisdom and astuteness are needed to succeed. Stitch can use this ability to pass that skill test no matter how tough it is. 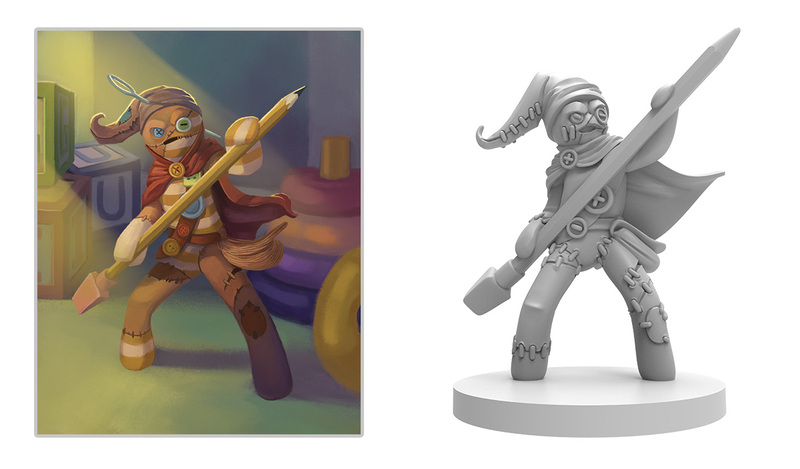 Join Stitch, and inspire a new generation of gamers when Stuffed Fables hits your local store later this year!